I can’t wait til there’s a grand stretch in the evenings. Winter light is no friend to food photography, I mean, I struggle at the best of times. So you’ll have to trust me when I say this salad tasted and looked much better than the photo suggests. I took a series of pictures to use but this was the best of a bad lot. I don’t normally go out to eat lunch when I’m working but I did wander into Zamora recently. (It’s lovely new place on Academy Street in Cork, I’d highly recommend it). I ordered the beef and blue cheese salad as I hadn’t had one in a while. It was gorgeous! When I told himself about it later he thought it’d be a great idea if I recreated it at home. He’s clever like that. 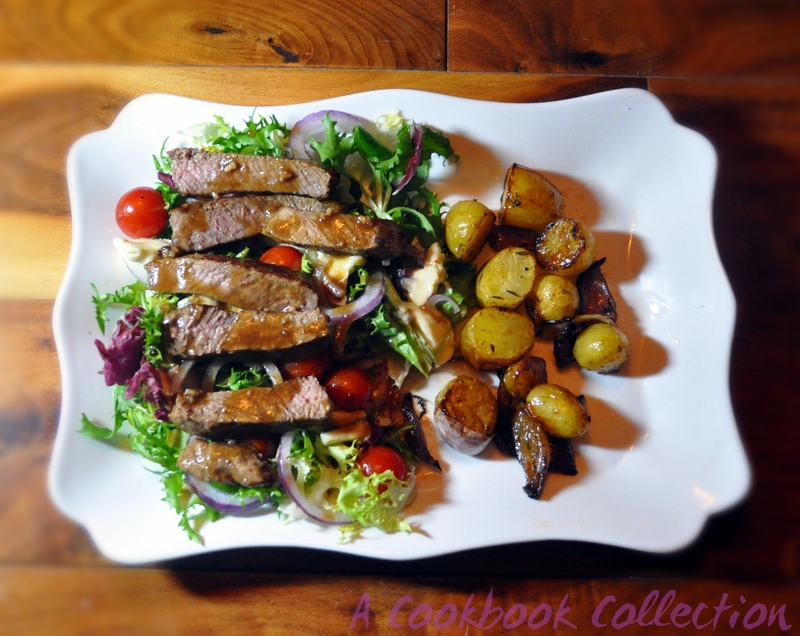 It is so tasty and easy to make so I will definitely do it as an alternative to steak and chips more often. It is normally served with sauté potatoes but I had made them with a chicken salad a few days beforehand so I went with new potatoes and onions roasted in balsamic vinegar. I’ll post a recipe to them soon*. You can go without for a lighter option. Use whatever blue cheese you like, I went with my go-to blue, Cambozola. Your choice of lettuce leaves – I used a salad selection from a bag. All about convenience here! Start by making the balsamic dressing. Put all of the ingredients into a jar, close the lid and give it a good shake to mix everything together. Taste it to see if it needs more seasoning. Set to one side. It will last for a few days in the fridge. Next remove the fat from your steak, you don’t need it here. Season the steak well with salt and pepper and cook to your liking. While the steak is cooking, assemble the rest of the salad. Lightly dress the lettuce leaves in some of the dressing. Finely slice the red onion and scatter on top. Crumble the blue cheese on top of them. Once the steak is cooked, allow it to rest for a few minutes. Discard most of the oil from the pan and turn down the heat to low. I like to toss the tomatoes in the hot pan just to roast them lightly. I think it sweetens them and brings out the flavour. You can skip this if you want and just add them straight to the salad. Once the beef is rested, slice it up and lay it on top of the salad. Pour over the remaining dressing and serve immediately. 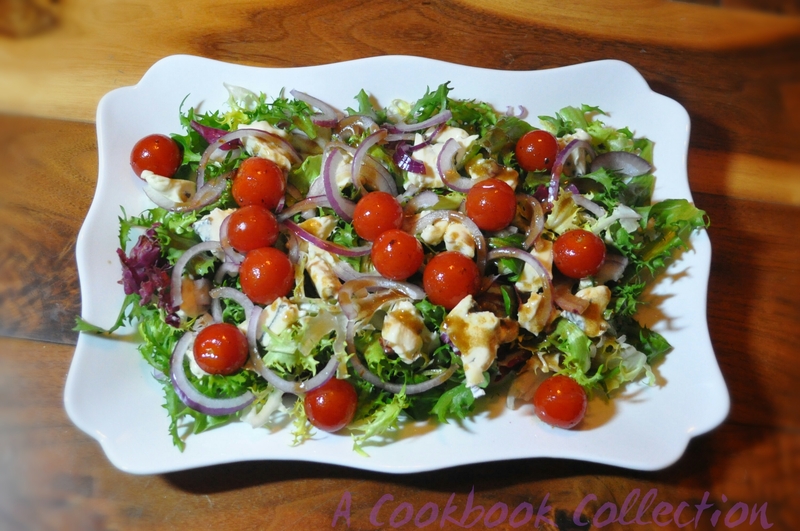 Elegant salad that looks great in any light. Good job. Thank you Conor, you’re very kind!